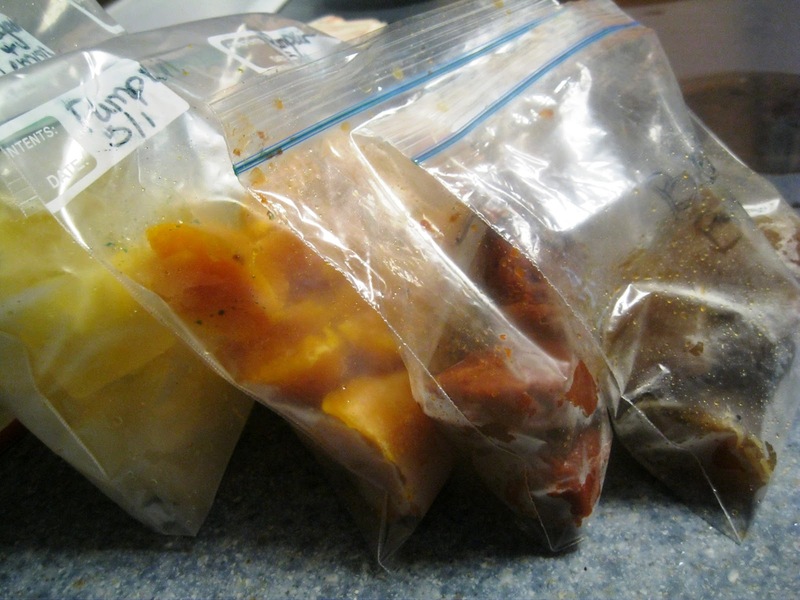 Store cubes in ziplock bags in your freezer for easy access! Definitely gonna put that one to use!!!! Crystelle, thanks for stopping by with such sweet comments! That's one of my favorites too. I have rosemary cubes in the freezer right now in fact! Those garbage disposer cubes are genius!! I can't wait to use the garbage disposal cubes! Good thinking! I'm so glad I found you at Penny Pinching Party! These ideas are brilliant, especially the garbage disposal and the yogurt for smoothies! I make my own baby food too and use the trays to make little baby food cubes. So much easier to pop them out to defrost in the fridge over night! Thanks Sarah! I hope you find a few things you like! These are great ideas Jan! Thanks for all the time, effort and love you put into your blog. Thanks Sabrina, You know that your opinion means a ton to me! I'm also glad I found you and your wonderful tips! While I don't had a disposal I do love lemon in my ice water. Never thought of putting then IN with the ice. Thanks for the tip...and all your others I'm putting to good use. I'm so glad you find me too! I love lemon in my water too! Thanks for stopping by with such sweet comments! Great tips! Love the garbage disposal idea! I currently purchase garbage disposal cleaner. This sounds like a great way to go! : ) Happy to be a new follower. I am so glad you found me! Thanks for stopping by the comment box today! When I found eggs on sale, I stocked up on them. I lightly blended them with a wisk and froze them in ice cube trays. With a little measuring, I figured out that 2 cubes=1 large egg. Great for baking or scrambled eggs, and they still look sunny in the plastic zip top bag in my freezer! I love that idea! I am so gonna try this! 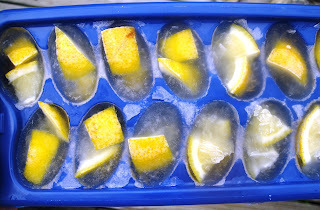 I freeze the organic canned pumpkin in ice cube trays and thaw one out every day to add to my dog's food. It makes her kibble more appetizing for her and is really healthy too. I never thought about adding pumpkin to dog food, that is a great idea! When you mentioned freezing gravy I pictured my dogs' delight when they discover the ice cube I give them to play with in the summer is frozen gravy!!! lol I'll dilute to stretch it further (4 dogs in our house) and they will be thrilled!!! Oh, my goodness, that is so clever! They will love you for it! you can also reuse the dogs bones that are hollow! i fill them with creamcheese or peanut butter and my dogs have a blast, because 4 dogs can be expensive i have 3 and they love when i freeze the hollow bones after they got all the other stuff out of them and give them to them the next day when thy r frozen filled, they last about 5 hours in southern heat. I run blackberries through an applesauce screen and freeze the pulp in ice cube trays. We use them for smoothies. I've used mine to put tea or koolaid in. That way my drink doesn't get watered down. My husband still loves koolaid, I'll have to do that for him! Thanks for the great idea! You have a lot of great ideas! I especially want to try the disposal cleaner! Thanks for sharing with us this week! I do freeze leftover coffee. My husband won't drink it if it has to be heated in the microwave, but I don't mind. Coffee is too expensive to dump down the drain. The other ideas I'm definitely going to try! Thanks to all the new ideas. I'm with you on the saving money! I use ice trays for storing extra eggs from my hens. One egg per cube fits well. Unfortunately, after freezing, the eggs are no longer good for frying, but they are great for scrambling and for puddings and cakes. They also work for quiche. The key is to blend them well. I would never have thought of doing that! That is such a great idea! Thanks for sharing! I have not heard of the master cleanse, it sounds intriguing. The cyanne scares me, but that's the cleanse part!LOL. I love the cucumbers and berries, that sounds so refreshing! Thanks for the ideas, I may research that master cleanse! I made and froze all of my daughter's baby food. It made everything so much less expensive and easy. I definitely need to get better at making little sauce cubes to grab out and use for lunches and dinners. Thanks for the good ideas! I am stopping by from the Homestead Blog Hop. Becky, I'm so glad you found me! Thanks for taking a moment to send me a comment, I love them! I make my own yogurt, so after I make a batch using a couple tablespoons of the store bought yogurt I freeze the rest in my ice cube tray. Then, when I'm ready to make another batch I just take out a couple cubes of the store bought, let them thaw at room temp (or add a little of the heated milk if I'm impatient) and use that as the starter for my next batch. It makes the store bought last a lot longer, and the cultures in the yogurt still work great even after freezing. I know what I'm picking up the next time I'm at a dollar store! Such great ideas. Thank you! This is absolute genius. Brilliant!! Deaanna, (Love that name, it's my Daughter-in-law's name!) Thanks for the invite, I'm dashing out the door in a moment, but would love to come back and link up! Can't wait to rummage around your site! I noticed that you said you made your own baby food...any recipes or pointers for a first timer? 2) watch for frozen vegies on sale. Frozen vegies traditionally have more nutrients than fresh in your store (unless you get a local farmers' market where it was just picked) because the vegies are flash frozen immediately after picking preseving their nutrients. Fresh produce in your typical store is several weeks old (if not more). 3) Think outside the box: avacado's, are great and don't forget to cook some high nutrient lentils and mash them and mix them in with other vegies, they are cheap and quick cooking, and easily take on the taste of what they are mixed with so is a great mix in food. Oh, right after Halloween buy some "pie" pumpkins on clearance at a store or pick your own stand and cook down a bunch of discount pumpkin. Awesome ideas! I'd love for you to add it on my link party at: http://printabelle.com/?p=4459 Thanks! Great ideas! I love the garbage disposal one! I LOVE your Log-in Name! Thanks for the kind words, I really needed them today! The garbage disposal cubes are pure genius. I will be doing this for sure. Also...why have I NEVER thought of the tomato paste one?! You are SO right...no mater how small the can you purchase, you never seem to be able to use it all when you only need a couple tablespoons for a recipe. Plus, it is more economical (at my store at least) to purchase a large can. I love your site. Thanks so much for the feedback and kind words! Have a great week! 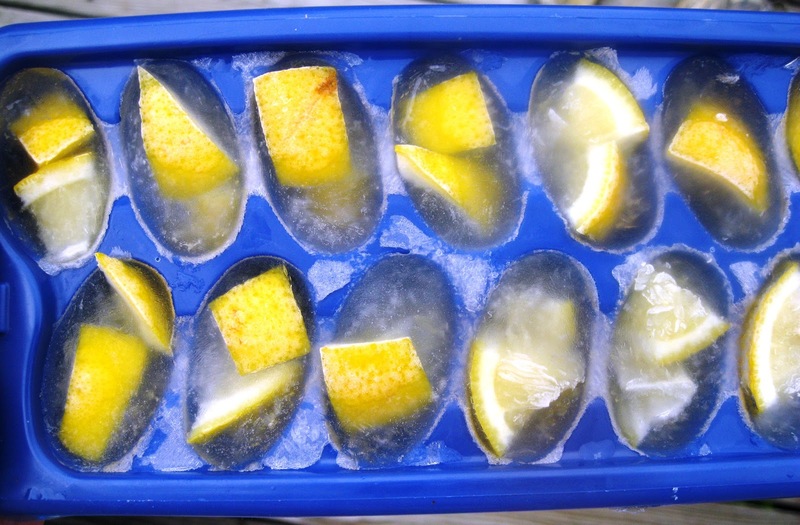 thanks for this money saving tips using ice cube trays. appreciate it!